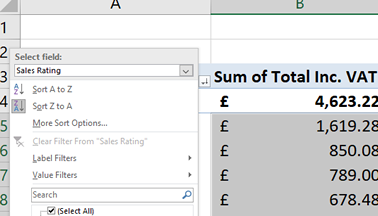 Sorting data or values within a Pivot Table is pretty straightforward, if you know how. Here's how you do it. 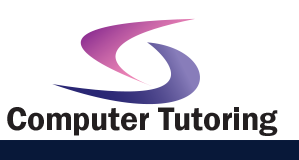 If you want to follow along with this you can download the sort pivot table exercise file. Create a Pivot Table and Add the field you need. Click on the Row Labels Drop down menu. Choose the field that you want to sort by. (If you are following along with the exercise file choose Country). From the same menu choose More Sort Options. 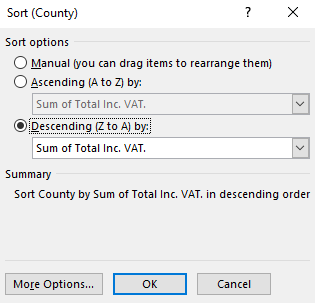 In the Sort (Country) dialogue box choose the Descending radio button, then choose the value you want to sort by. (As you can see from below I choose Sum of Total Inc. Vat). Click OK and view your results.